We produce a single 'Permaculture design' for the client/site based on the needs of the site and the client. Neither the drawing nor the report are a perfectly-to-scale landscaping job implementation plan. The purpose of the diagrams/plans are to layout and locate the systems, plantings and zones in the design report. Everyone would create a slightly different layout and design for the same space and circumstances - you are paying for our experience to produce a more complex integrated design with systems/techniques that are known to work locally. 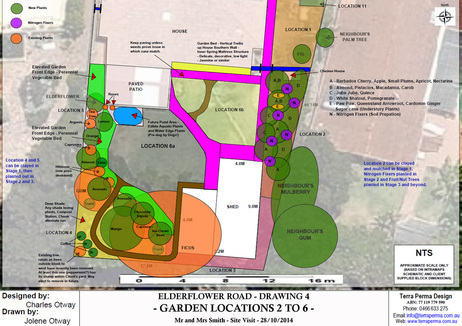 Given that our Permaculture Design Report and plan is a rationalised, interconnected, system design which is completed in one siting considering all the data available, it is not logical (nor optional) that we revise and alter small aspects 'ad-hock' afterwards to the clients tastes. The client will be responsible for implementing the design - either in full, or part - utilising aspects that they like and/or modifying the design as their vision or project evolves. Permaculture Design is an organic process. Things change in nature and thus so must our systems and their 'plans'. It is essential that the owner is the brains and crafter (shaping aspect) of the system over time, which is why we prefer to teach people how to do Permaculture design via a PDC course and mentor you through your own designs over time, rather than producing 'our design' for you that can be hard for you to evolve over time. This is a 2 hour site visit, walk and talk. A verbal discussion about your design options for your site and each of the more obvious micro-climates. This is charged at $100/hr for two hours (total cost $200) and includes travel to locations 10km from Innaloo. It is most suitable for urban blocks (any size). Often if we see eye to eye on the design vision and plan, clients will often ask for an upgrade to a Urban Design Consult to get a design report and layout plans for the extra $400. Prior to the meeting we will send you a Client Review to focus ﻿and﻿ broaden your thoughts, and we will review your site plan on Intramaps. We will give you a copy of our generic Perth Permaculture Design DIY Booklet with tips; design processes and local knowledge; and sources of soil, trees, etc. The walk and talk discussion/advice would usually include: where to place different elements (shade trees, chook runs, ponds, windbreaks, paths, nurseries, composting etc) around the yard, how to make the most of your resources, and broad site planning (sun, water, nutrients). You will be responsible for taking notes and getting answers to your issues in that time. The $600 fee includes a two hour site visit. We will review and increase the details on the client interview sheet, walk and talk your vision and opportunities around the site. We spend less time talking and telling you what we would do and more time documenting and thinking, you may only need to be available for 1 hour but while onsite we will measure, photograph the site carefully so we don't need to come back, this might take an additional 1 hour. After the site visit we will produce a report of what was discussed, rationalise the ideas into a basic Permaculture Design, create a 'roughly-to-scale' site map (+/- 1 m based on council intramaps), and recommend an element layout and proposals for your yard. We can meet your needs in some areas of focus, prioritizing tasks, etc. The report includes where to place different elements around the yard, guilded tree planting ideas and locations, nutrient cycling and food production systems, designed for your time and family limitations. Plus local advice on soil building, garden bed and garden structures construction, veggie growing, ponds/aquatic food, fruit and fruit trees. It is most suitable for urban blocks (any size), but can be applied to rural "kitchen gardens" also. It will be at least 10 hours work for us at an average of $50/hr plus 2 hours on site at $100/hr (hence a total cost $600). Please note that all pricing includes travel costs to locations 10km from Innaloo. Beyond this distance travel time/costs may be included or we can assist you to find a more local designer. This report can take 1 month to produce depending on other ongoing work and family commitments, so please make sure we talk about delivery timeframe requirements. Please see the 'Please note' at the top of the page and ensure you understand the nature of this design service, or give us a call (Charles - 0466 633 275) or email (info@terraperma.com.au) to clarify. We are not generally keen to produced Detailed Permaculture Design reports even though they are well suited to the larger, peripheral urban or smaller rural properties. Permaculture systems are organic processes - things change in nature - and thus so must our systems and their 'detailed permaculture plans'. The more detail and fixed the design, the sooner it becomes redundant due to planned and unplanned change. This sort of report would be a week's work and our time would be better spent teaching half a PDC to you or, even better, you and your support network (better half / friends / community group)! It is essential that the owner is the brains and crafter (shaping aspect) of the system over time, which is why we prefer to teach people how to do Permaculture design via a PDC course and mentor your own designs over time, rather than producing 'our design' for you that can be hard for you to evolve over time. Please contact us directly to discuss this type of consult and reporting to ensure it will be of value to you. Please also note that beyond a 20km radius of Innaloo, additional travel time/costs may be included. Our 'on your site' advice and services can be arranged on an as needs basis, by agreement. Please discuss your proposal with us via email (info@terraperma.com.au) or by phone on 0466633275. $100/hr on your site consult rate. $50/hr working from home (within a week) consultation rate.